Welcome to the final day of Web Summit. Well done for making it this far. It’s been a different sort of conference to previous years. There’s been a lot of soul-searching about technology’s wider societal impact. Discussions about how to regulate technology (we seem to have moved beyond the “if” stage) have featured heavily throughout. The US is looking at what it can learn from European antitrust rules, the EU's competition commissioner said yesterday. But so far, the EU’s main weapon has been whacking companies with big fines. Where do we go next? Away from the top-level talks (and Tony Blair), there have been glimmers of excitement for the future. On the “Deep Tech” stage yesterday we were treated to a talks on the brain-machine interface and quantum computing. I sat down to chat with Furhat Robotics, who are working to build customizable “social robots” (full report to follow). As a sucker for magic tricks, I enjoyed Marco Tempest’s drone demo (see the photo above). There have been plenty of chats about the fascinating, varied ways machine learning is being deployed, from saving lives to helping people to find love. The discussions on the main stage are eclectic as per usual today. Topics vary from electric scooters, cannabis tech startups, and VR to serious, fundamental questions like whether big tech companies need to be broken up, why Chinese startups now get more investment than Silicon Valley, and whether we’re addicted to our smartphones. 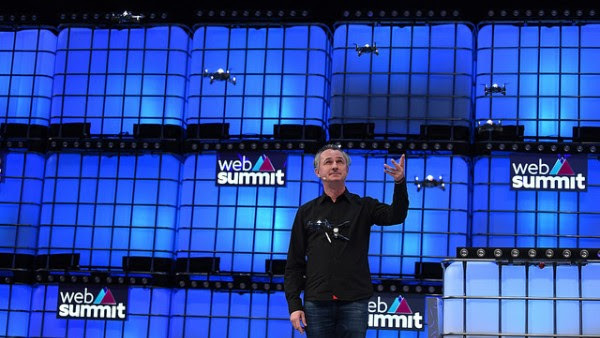 If you’re also attending Web Summit, hang in there, you’re nearly done. If you aren’t, I do hope you’ve found this week’s Download a useful insight into one of Europe’s biggest tech events. As always, I’d love to hear thoughts. State Grid Corp. of China is building the world’s first 1.1 million volt transmission line, which could give renewable energy a boost while also extending China’s global power. What’s happening? State Grid is probably the biggest company you’ve never heard of, with nearly one million employees and 1.1 billion customers. It was the second-largest company on Fortune’s Global 500 list last year. It’s now building a transmission line that will be able to deliver the output of 12 large power plants over nearly 2,000 miles, sending 50% more electricity 600 miles further than anything that’s ever been built. Ambitious goals: The company aims to stitch together the electricity systems of neighboring nations into transcontinental “supergrids” capable of swapping energy across borders and oceans. Bigger picture: Massive networks like China’s new 1.1-million volt transmission line could help slash climate emissions by enabling fluctuating renewable sources like wind and solar to generate a far larger share of electricity. But facilitating the greater use of renewables clearly isn’t China’s only, or even primary, motivation. Stretching its ultra-high-voltage wires around the world promises to extend the nation’s swelling economic, technological, and political power. Read the full story here. A new report has called for more transparency over how companies collect data on children. The first truly digital natives: Children growing up today are the first to be “datafied” from birth and are the “canary in the coal mine for wider society,” says the report by the children’s commissioner for England. On average, by the age of 13, parents have posted 1300 photos and videos of their child to social media, the report says. And by 18, children have created 70,000 social media posts. The report highlights internet-connected toys, smart speakers and baby cameras, used by or for children not yet old enough to own a smartphone. There hasn’t been enough thought given to the consequences of all this, the authors argue. Main findings: The report says the government should consider strengthening data laws to protect children. It also calls for children to be taught about data collection in schools and for companies to take more responsibility. "Companies that make apps, toys and other products used by children need to stop filling them with trackers and put their terms and conditions in language that children understand,” Anne Longfield, the Children’s Commissioner, said. AI isn’t up and coming. It’s here. Register for EmTech Digital to get clear insights to help you cut through the noise and chart your strategy. Our roundup of today's top tech news to get you thinking and debating.